You Are Cordially Invited to a Roqa. Tapioca pearls and potato-green-asparagus mash – flaming -- with pickled yogurt chutney alongside. Somehow I’d missed the drum roll for aRoqa when it opened in June. Maybe it was muted. But a friend sent me an alert in July with photos of every dish. Yet another new Indian venture, probably modest. I dismissed it. “Lamb shank in this heat?” Really wonderful, she insists. We agree to meet. 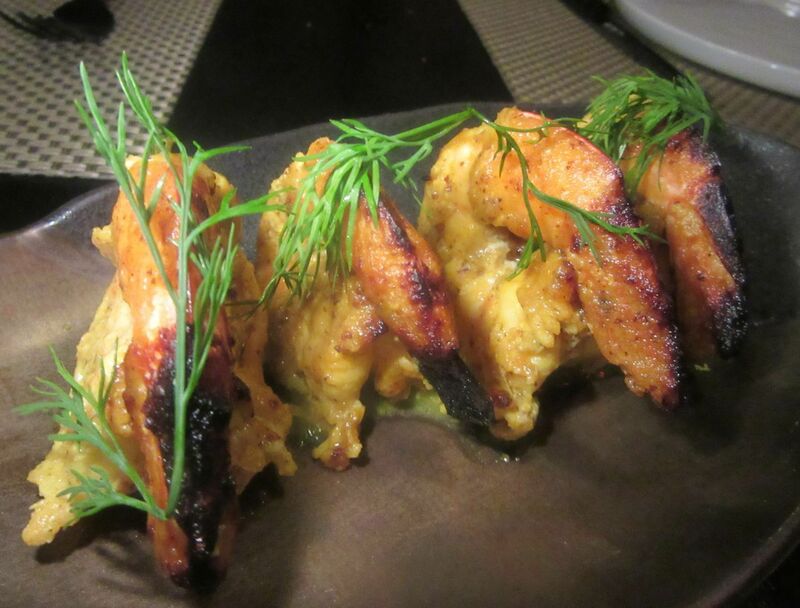 Chef-Partner Gaurav Anand enjoys dramatizing his street food concepts. 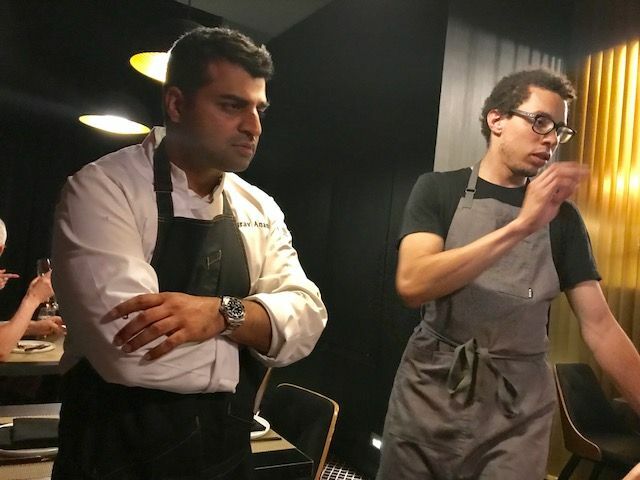 It seems chef-partner Gaurav Anand, who owns Awadh, my favorite Indian grazing spot on the UWS, is inspired here by a roqa, a traditional Indian engagement party. His partner is London-born Monica Saxena, whose wedding he catered. The swank gold overhang and black-framed glass stand out on the mishmash of Ninth Avenue. 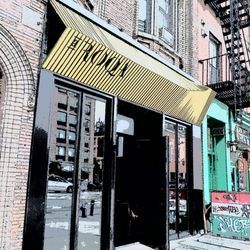 With its swank gold overhang and black-framed glass, the narrow storefront certainly stands out from the mishmash of Ninth Avenue just south of 23rd Street. I’m early. Two guys, one of them interrupting his bar duties, cannot find my friend’s reservation on the house iPad and they are arrogantly bratty about it. 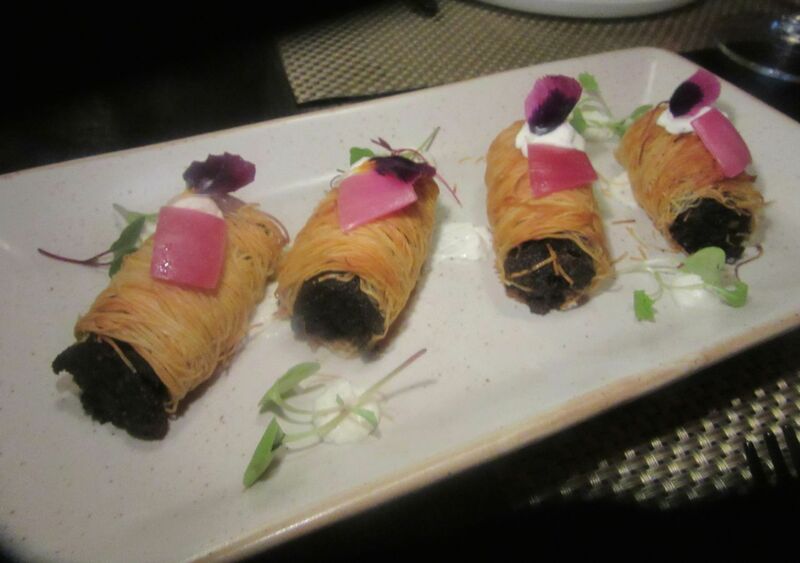 Saffron-scented wild mushroom is wrapped in kataifi and dotted with goat cheese relish. “But, of course you have it,” I insist. As they retreat in umbrage, a server explains the reason they can’t find our reservation is that a notation indicates we’re already seated in the back room. “Is this the Twilight Zone?” I wonder. 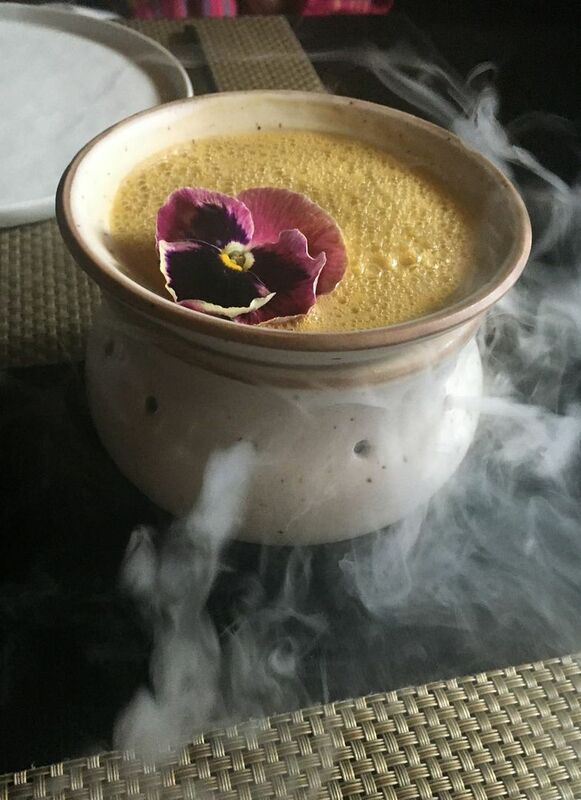 The cocktail “Shadowplay” comes in a pottery bowl with dry ice smoking. I study the cocktail list and watch the defiant bar master shaking a mix, pouring, and sending it out smoking with dry ice. “I’ll have one of those,” I decide. Shadowplay: mezcal and clementine-cactus water. It comes smoking in a bowl, a lot of showbiz for just $12. My friend arrives, waving a printout of her confirmation, primed to attack. Corn-rice paddu balls arrive on a black iron bicycle with coconut-kaffir lime chutney for dipping. “Never mind. They’re a bunch of amateurs,” I say, dismissing the annoyance. “We’re seated. Get a drink. We’ll expose them on Twitter.” Just as our third guest checks in, the waitress delivers corn paddu balls piled into the basket of a miniature black iron bicycle with coconut-kaffir lime chutney sauce in another basket on the handlebars. How cute can it be? And delicious, too. 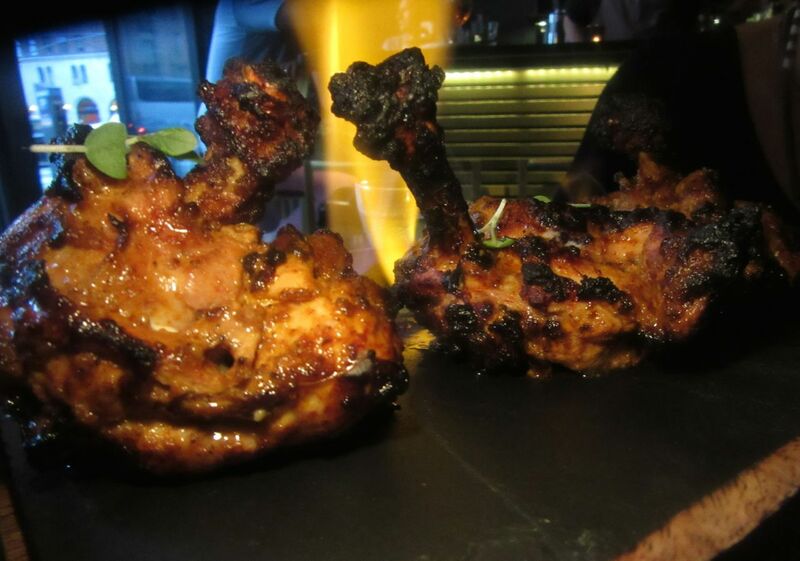 Flaming rum is poured on the sensational bhatti murgh chicken chops, singing them even more. Just like that, we’re all seduced. Cute and delicious. 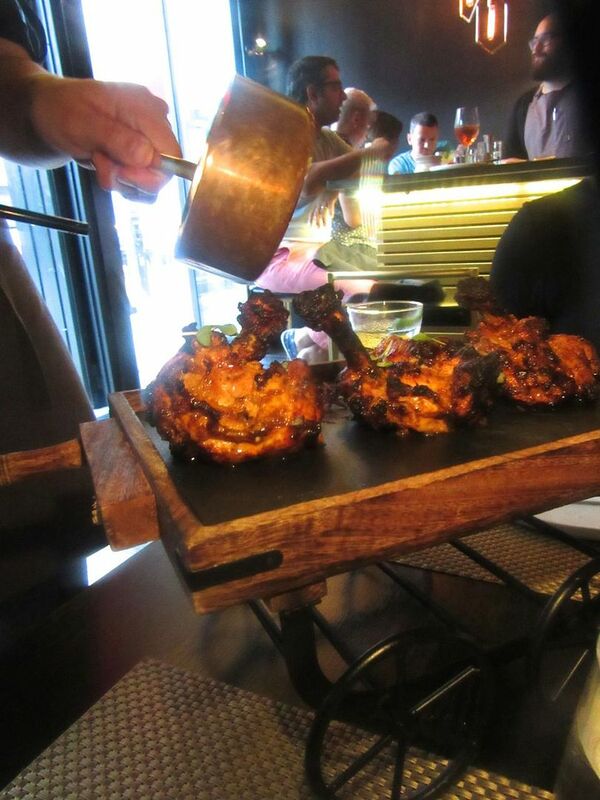 Chicken chops caramelized in the tandoori oven ride to tabletop on a wrought iron and wood wagon. A kitchen runner spills Old Monk rum on the already singed beauties and when the alcohol burns away: ohmygod. The dark leg meat is juicy and complex, inspiring a chorus rivaling the Supremes. Our tardy fourth arrives just in time. 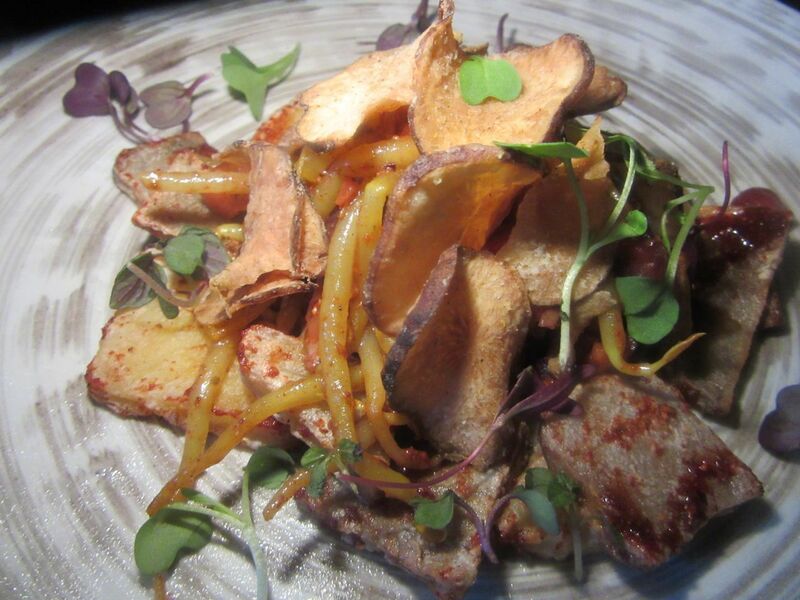 Sunchoke chaat is tossed with sweet potato and bean sprouts in pomegranate emulsion. We’ve all got drinks now and are sharing sunchoke chaat, a toss of sweet potato, pomegranate purée and seeds, bean sprouts, and sunchoke chips, another play on the street snacks you might find in India. 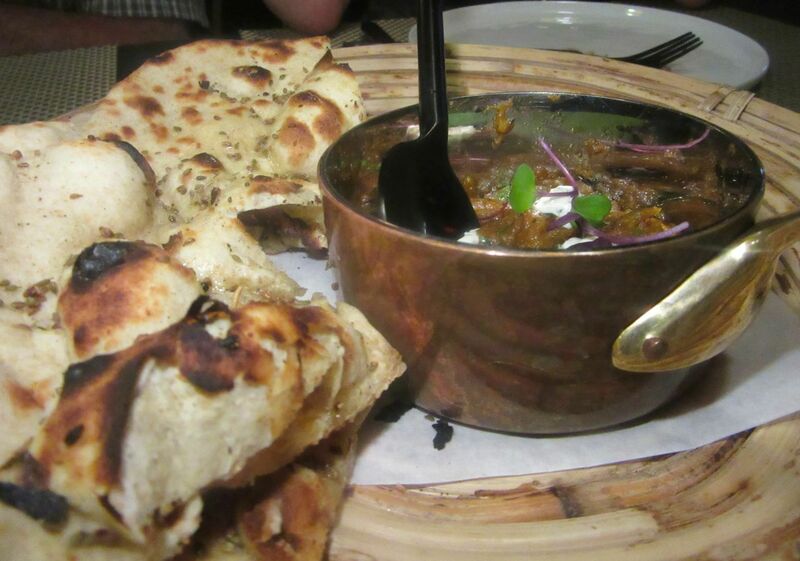 The minced lamb kulcha with a side of the chef’s “special sauce,” is not all that special. But that’s a minor hiccup. A pause gives us time to notice that the table itself is very smart, with woven mats, sturdy black-coated stainless-steel flatware and clay bowls (custom-made in India) for drinks, desserts and pilaf. These rum-flamed chicken chops are a must. We ordered them every time we came. 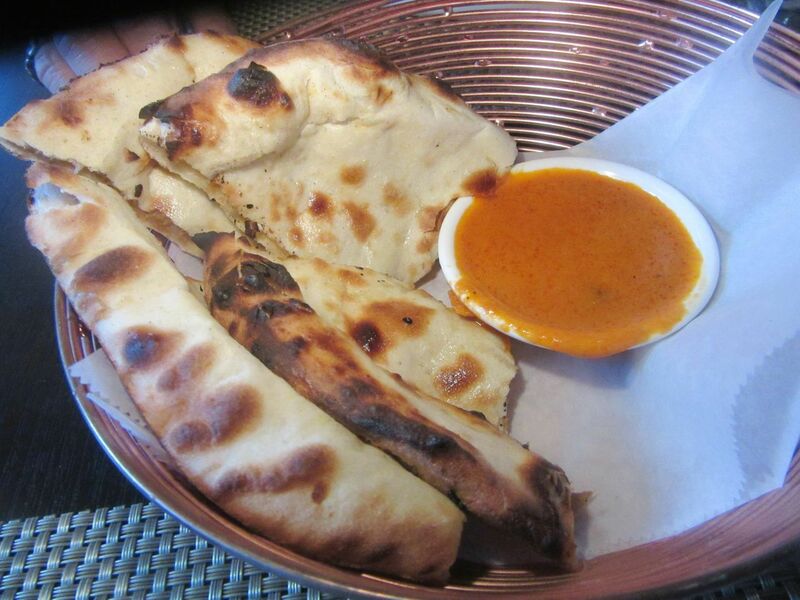 The minced lamb kulcha is served with “chef’s special sauce.” It’s an Indian restaurant. We must have kulcha. It doesn’t matter what I think anyway, I realize. aRoqa has already been discovered. Sitting near the door, I watch the parade, mostly young people, many that look Indian to me. Then, when it seems the house must surely be full, a tiny white-haired women in an exquisite embroidered turquoise sari is led to the back room, a frail little man following behind with half a dozen millennials escorting. An engagement party, we are told. aRoqa indeed. I ordered the lamb shank twice. Once it was falling-off-the-bone perfect. The second time it was tough. The dance of shaking cocktails builds – wildly noisy now -- the bar in siege, as our bigger, more expensive “shared plates” arrive. 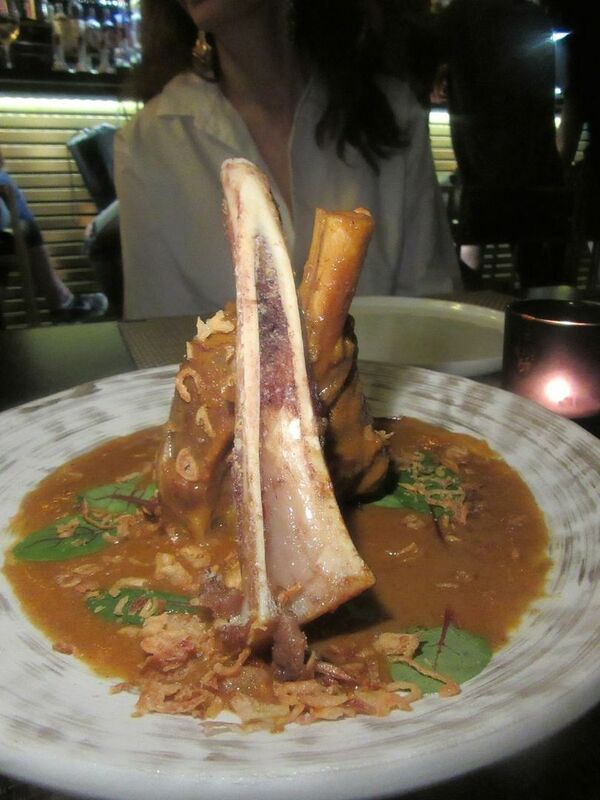 Lyn, wanting to revisit the wow of her original dinner here, has insisted on the lamb shank from the entrée offerings. 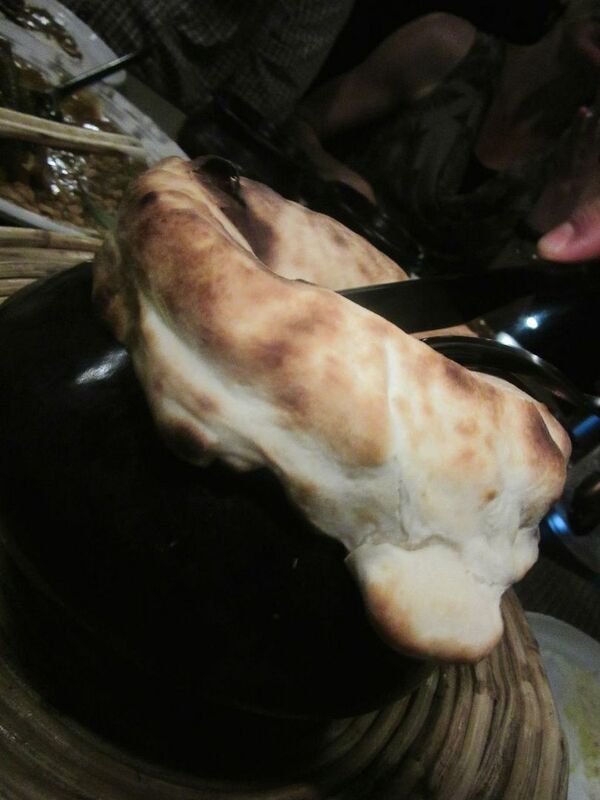 It arrives sprinkled with onion crisps, standing up in a puddle of yogurt-gravy with saffron rice – its long marrow bone propped on top, enough for all of us to share. 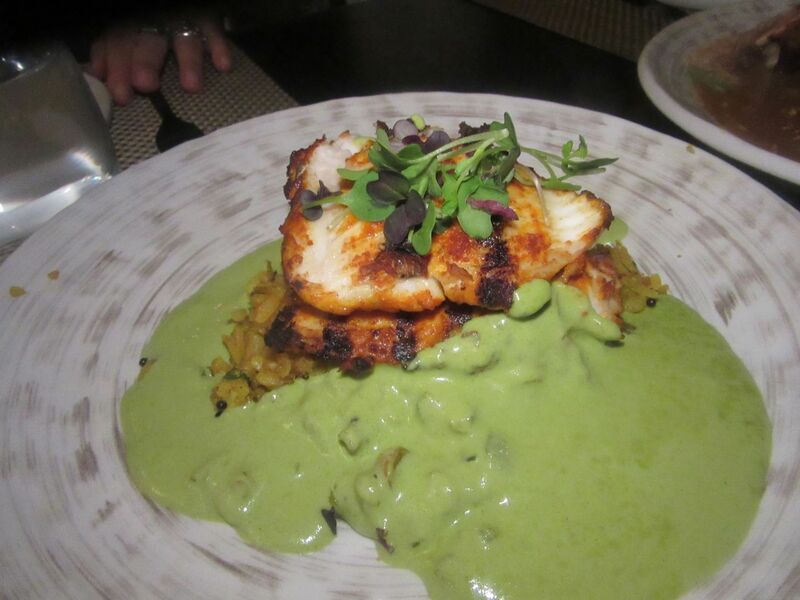 The sea bass sits in lemongrass-kaffir curry on beaten rice pilaf. The sea bass in lemongrass-kaffir curry on beaten rice pilaf is served alongside. On still another visit we’ll divide large chunks of Sigree lobster in a pleasing garlic-lemon pepper pool. The chef himself will arrive to peel the bread coverlet off the dum pukht lamb pilaf he also offers uptown at Awadh. Chocolate soufflé with filter-coffee ice cream and rusk crumble gets flamed too. The “splash and ignite” is never-ending. 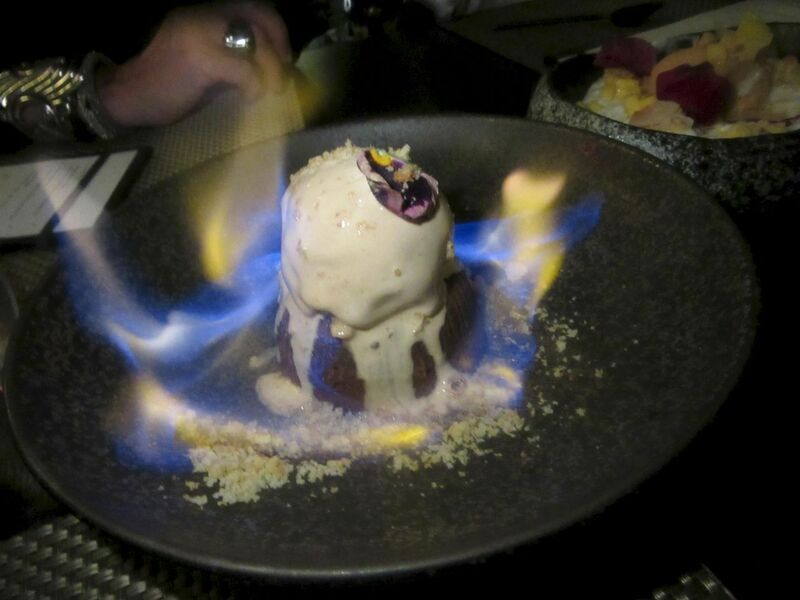 Chocolate soufflé cake with bitter coffee ice cream gets flamed too, more showbiz that it scarcely needs. Spared cremation, mango sorbet with scattered squares of fruit, a sweet emulsion and almond flakes is especially refreshing. 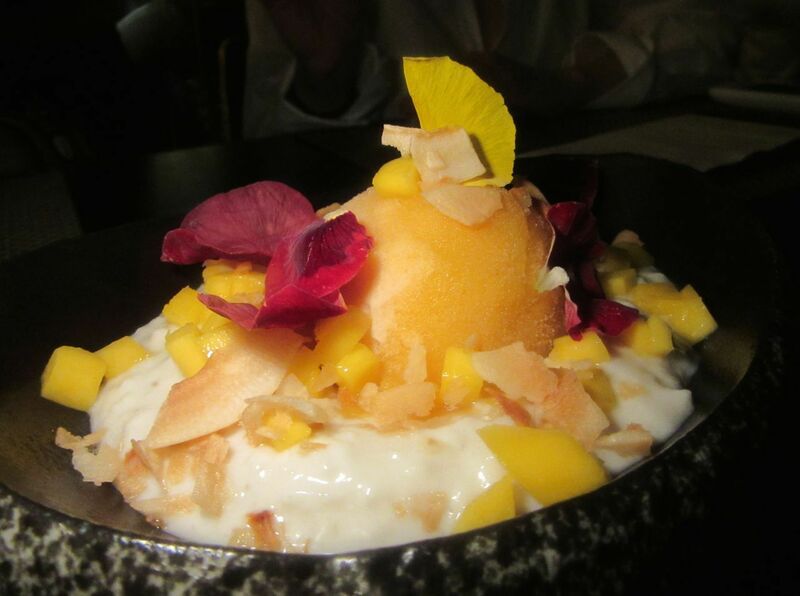 Mango sorbet on fruit is wonderfully refreshing after all the drama and our usual excess. None of us are tempted by the chef’s gift, a drift of saffron foam on baba au rhum. The bill comes in a sandalwood box, $44 each plus tip. I take a copy because I’m already planning to return and continue exploring the menu. The cocktails by mixologist Stephen Thomas are as exotic and inventive as the food. I’m back that week with vegetarian friends, figuring they can make whoopee with an Indian menu while I explore new tastes. 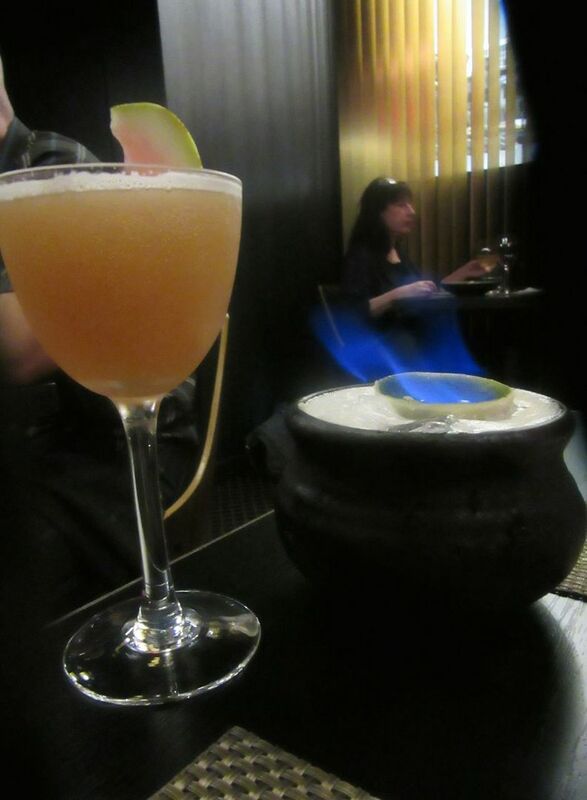 I flip a flaming lime shell upside down in a Through My Sails adding booze to my bowl of pineapple lemongrass rum and sherry. The kitchen sends four little pods of kurkuri bhel -- crispy lotus stem salad with avocado, peanuts, puffed rice, tamarind and a purple flower petal. 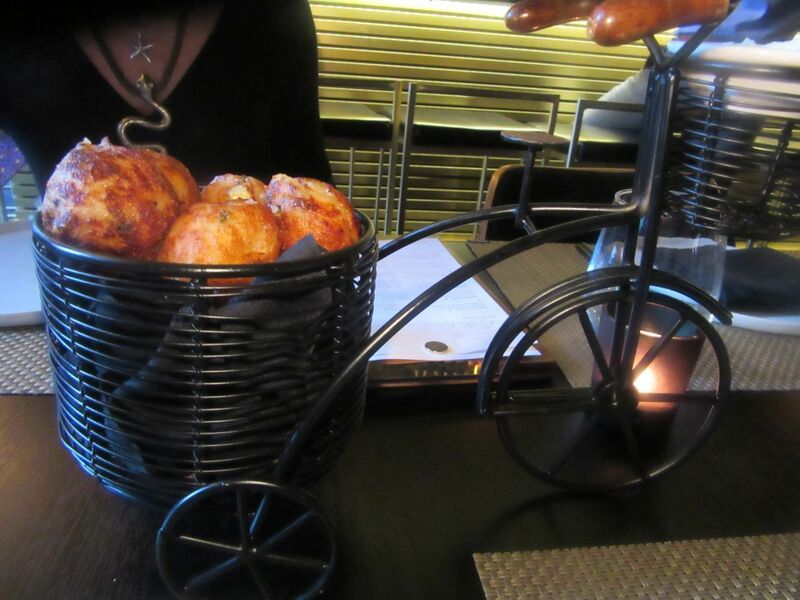 I can’t deny my pals the corn croquettes on a bicycle just because I had them last time. They arrive even before their drinks. “What is colocasia?” we ask, ordering Kandhari Arbi anyway. 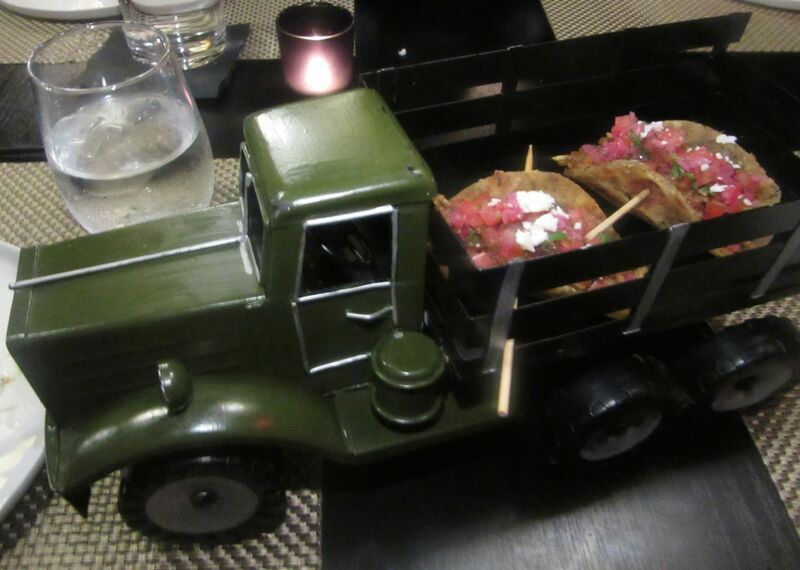 The waiter brings tacos in a truck and the chef himself explains. 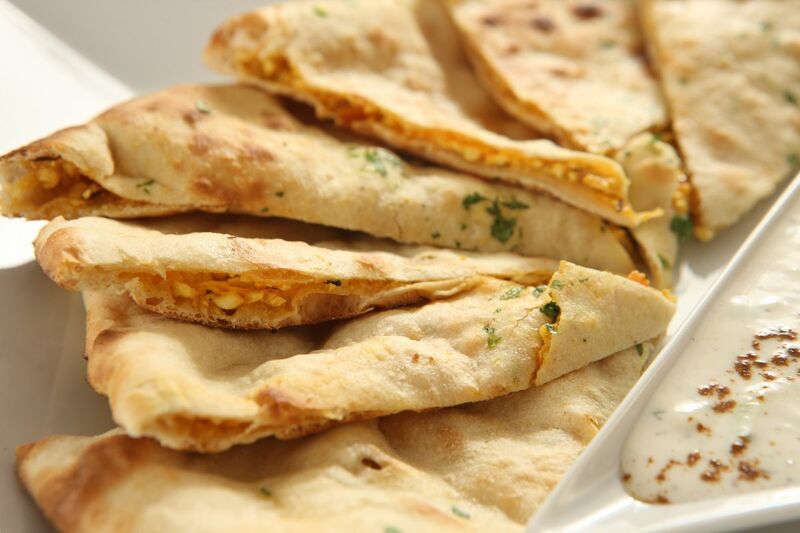 During a brief vegetarian phase he never found a taco he liked, so he invented this one with colocasia, a popular everyday root vegetable in India, stuffing it with pickled onion and queso fresco into a Gujarat-style fenugreek flatbread. 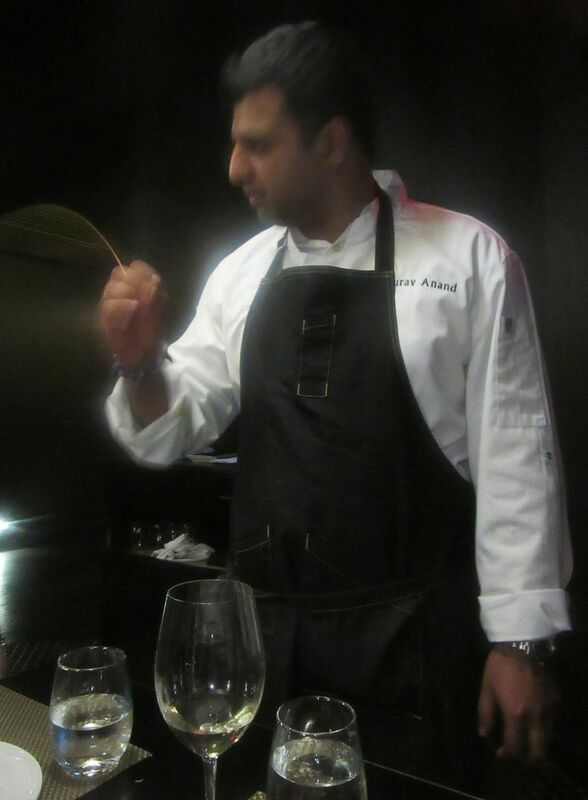 Chef Gaurav Anand introduces mixologist Stephen Thomas. Photo by Dana Stoddard. Since all of us are taking photos, the chef goes Bollywood. 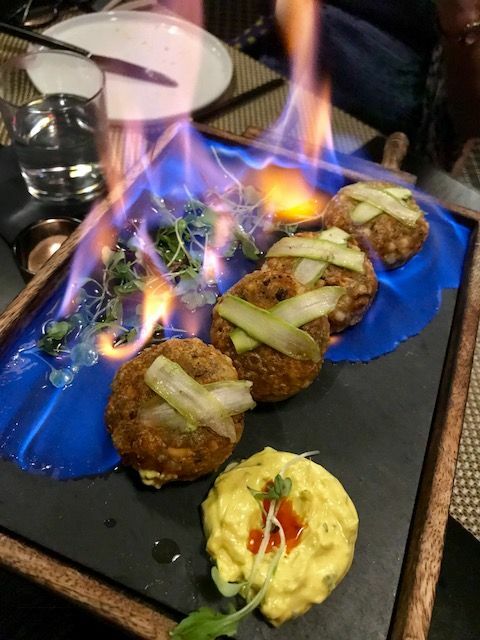 He’s there to pose, to introduce mixologist Stephen Thomas, to ignite the vodka and flambé our sabudana tikki – tapioca patties made with potato, peas, onions and ginger with a core of green pea and asparagus purée. They’re topped with shaved asparagus and served alongside gram (chickpea flour chutney made with yogurt, turmeric, black salt and honey). More theater. More deliciousness. 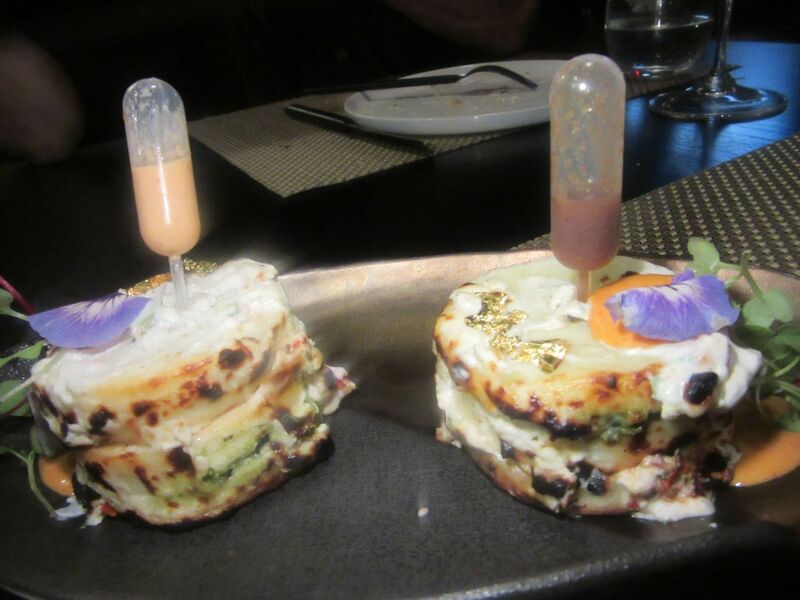 Paneer layered with Amul cheese and pierced with pipettes of seasoning sauces is more fun than delicious. 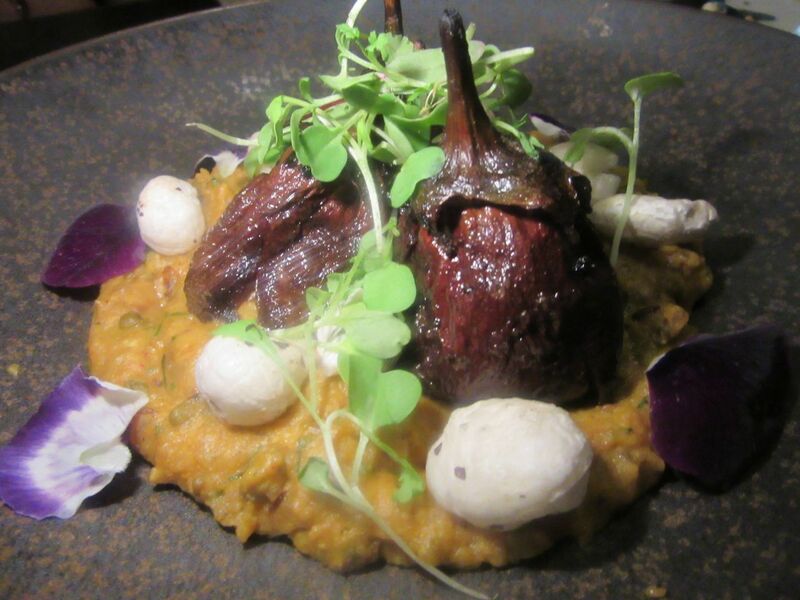 Achari eggplant is pickled and deliciously nested in green lentil-pearl millet porridge. 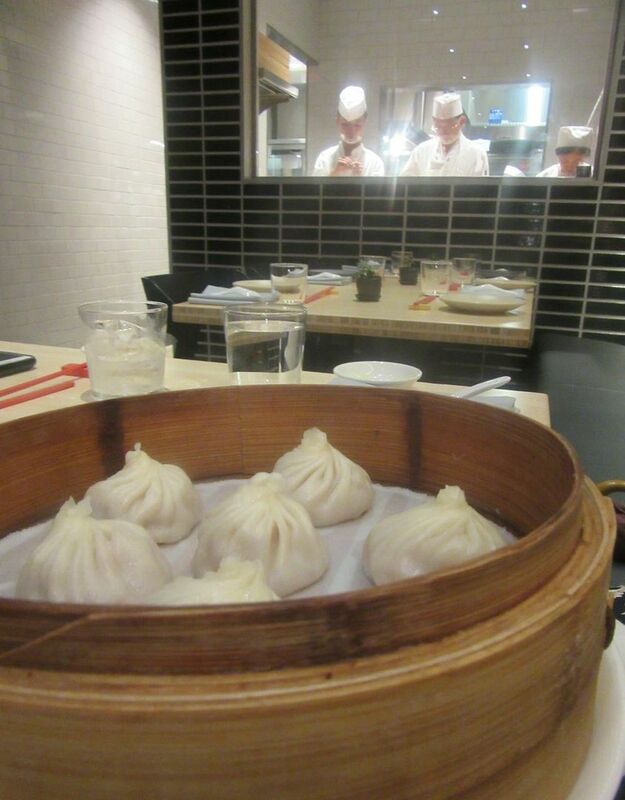 Mostly we order small plates or items “From the Chef’s Table” priced from $10 to $18. The wild-mushroom-saffron croquettes wrapped in kataifi (shredded phyllo) with dabs of goat cheese relish are two bites of a hit. 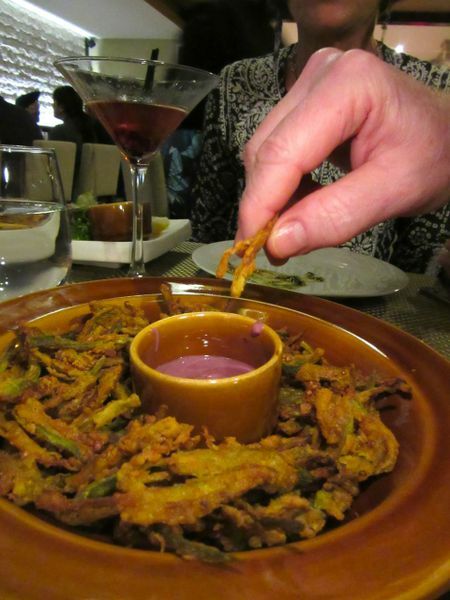 Eggplant Ambasari comes in the bowl to be stuffed into carom seed roti. The eggplant fan in me is content to divide Achari Baingan, the small Japanese variety pickled sitting in green lentil-pearl millet porridge, from the shared larger portions under “Coming Together,” $18 to $26. Somehow the total for food on three visits seems to run about $90 before tip for four, so it’s the bar tab that might determine if dinner costs $60 or more, tax and tip included. The chef peels off the bread coverlet on the dum pukht lamb pilaf with ginger-fennel spicing. It’s only Thursday, but the front room is packed again and painfully noisy. We can barely hear ourselves speak in what has seemed the sanctuary of the rear room. There is a woman at the bar screaming to be heard over the din. “Do you think she is being murdered?” I ask the chef. He smiles. Crush and chaos must warm his heart. With entrance tables full and bar-clingers three-deep, the path to the door is barely wide enough for us to inch sideways toward the exit. Small prawns are basted in Calcutta mustard marinade and served with pickled fennel chutney. 206 Ninth Avenue between 22nd and 23rd Streets, 646 678 5471. Sunday through Wednesday 5 pm to midnight. Thursday through Saturday till 2 am.